SAN LUIS OBISPO — The Cal Poly Floral Design Team ranked second in the nation at the American Institute of Floral Designer’s (AIFD) 2017 Student Floral Design Competition held July 1-5 in Seattle. Senior Dawn Mones, an agricultural and environmental plant sciences major from Kapaa, Hawaii, won high honors at the event with the overall highest student score for the competition. Mones placed first in the wedding bouquet category and second in the fashion flowers and people’s choice categories. Students competed in the competition’s four categories: interpretative, fashion flowers, wedding and sympathy. Alumna Sara Do placed fifth in the fashion flowers competition and sixth in the wedding bouquet category. Do, from San Gabriel, California, graduated from Cal Poly in spring 2017 with a degree in agriculture and environmental plant sciences. Kristen Cotter, a senior agricultural and environmental plant sciences major from Palos Verdes Estates, California, placed sixth in the wedding bouquet category. The three-member team was led by Cal Poly Lecturer Melinda Lynch and alumna Katie Noonan. “I am proud of the hard work that these students put in to prepare for the competition and I am thrilled for Dawn’s accomplishments,” Lynch said. The student AIFD maintains chapters at 15 colleges and universities throughout the United States and Canada. The mission of the American Institute of Floral Designers is to advance the art of professional floral design through education, service and leadership, and to recognize the achievement of excellence in this art form. Established in 1965 AIFD is, today, the floral industry’s leading non-profit organization dedicated to establishing, marinating and recognizing the highest standard of professional floral design. For more information, visit aifd.org. Cal Poly is a nationally ranked, comprehensive polytechnic university. The university’s College of Agriculture, Food and Environmental Sciences is comprised of expert faculty members who take pride in their ability to transform academically motivated students into innovative professionals ready to solve the complex challenges associated with feeding the world in sustainable ways. Students have access to state-of-the-art laboratories, including ranch land, orchards, vineyards and forests, all of which provide the basis for Cal Poly’s Learn by Doing methodology. It is the fifth-largest college of agriculture in the country, with 4,000 undergraduate students. 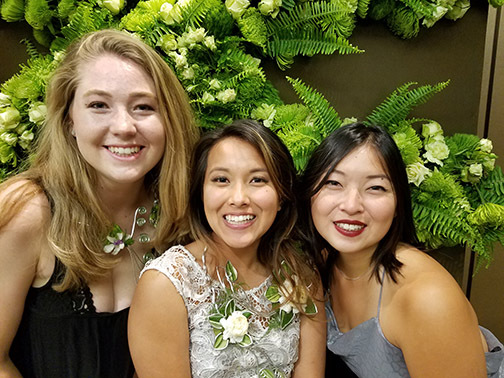 Photo information: Floral.jpg — Members of the Cal Poly Floral Design Team are pictured at the American Institute of Floral Designer’s 2017 Student Floral Design Competition. From left: Kristen Cotter, Dawn Mones and Sara Do.